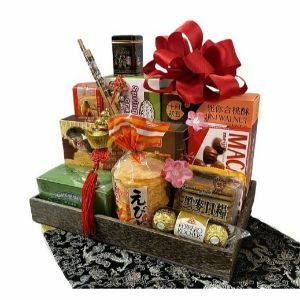 The tray includes:- Walnut cookies, Money Charm, Money envelope, Sesame sticks, Hot spicy peanuts, Nori Savory Crackers , Pocky Chocolate sticks, Green Tea box, Mango slices, Shrimp rice crackers, Pineapple Cakes and Ferrero Rocher trio. Shown wrapped here....Organza or satin ribbons complete this gift. Note: Delivery possible only in limited cities. Note: Please select "OTHER CITY" above, if the destination city is not listed. Note: This total amount includes product price, shipping price and if any addons selected. Note: Your credit card will be charged in USD or choose from available currencies during checkout. Standard Ground : Your gift will be delivered in 3-5 Business Days. We ship per each carrier’s rules and regulations and are bound to their policies. The cut off time is 12 PM EST (time in usa) Monday through Fridays.If we receive the order after that, we will proses your order on the next business day and inform you about it. Your order would be processed based on the success of your payment. The cut off times refer to the recipient's time zone. Once the package has been handed to the shipping carrier that liability of the package no longer lies with Giftsnideas nor are we liable for lost or stolen merchandise. Giftsnideas has no control over a carrier’s actual delivery time or their decision if your location is considered "safe" to leave a package. If a delivery attempt has been made, the carrier will leave a notice which the recipient must follow. We suggest that the recipient contact the delivering carrier to verify where parcel was placed. If a package is returned for any reason without prior return authorization, no refund will be issued. Sometimes, if the delivery area is remote we may have to charge you extra delivery charges depending on the location and the nearest available city/town. This will, however be done with your permission and only after communicating the issue on hand to you. We will try our best to avoid such a situation before contacting you about this. While it is rare that we substitute your order components, there are times when substitution is required for items like flowers and baskets delivered by the local florist. Whatever may be the case, our guarantee of quality gifts, fresh, beautiful flowers and on time delivery always stands true. If we are out of a particular item like a basket or a container, a similar item or element of equal or greater value is substituted. If we run out of a particular flower, we may substitute with another flower while ensuring that the look and feel of the floral arrangement is as close to the original as possible. Sometimes, in cases like Teddy Bears or cakes we may have to ship a different colored or flavored product or if we run out of a particular item in a gift hamper a similar item or element of equal or greater value is substituted . Please note that the images shown on the site are indicative of the product and are upgraded versions. Thus, the flowers upon delivery would be similar to the product shown and will be for the value paid by our esteemed customers. At Giftsnideas, we have a friendly refund policy to ensure your online purchase is hassle-free and we make every effort to ensure that you receive excellent service. Our Refund policy is applicable for the below cases. Mismatch of the Delivered Product with description on the website. Late Delivery of Product, i.e., wrong date as we do not guarantee specific time for delivery. At Giftsnideas, we make every effort to ensure that customer support resolve the customer issues fast and impeccable. Customer can raise their Complaints by sending email to customerservice@giftsnideas.com within 30 days from the delivery date. In case of any delivery issues, we request customers to send photos of the product's received and Order details. Customer should raise a Refund request within 30 days from the delivered date. After verifying all the order information, we process the request for cancellation. Post cancellation of the order, refund amount will reflect in your account within 5-7 business days. (Does not include Saturdays, Sundays and Holidays). Partial refunds shall be applicable in cases of Bad Delivery or Late Delivery, which is solely at the discretion of the company. Thank you very much. I finally got the message that the order has been received by my father. It is so wonderful gift. I got his pic and beleived my eyes. Thank you very much once again. Thank you very much! I am very pleased at how great yall have been! Thank you so much for following up on this. Much appreciated! Will order again from here. Merry Christmas. My item is deliver.thank you so much. i will be buy items in your company onliline in future. Thank you for delivering the gift on the dot for the second year in a row ! The celebrant called me to thank. Want to thank you for the service, the gift was received. You really have a very good service. Thanks a lot!